The Election Commission’s announcement of Lok Sabha election dates on Sunday had two significant fall outs: Pakistan went missing from prime time television for the first time since the Pulwama attack on 14 February. Political advertisements across media were suddenly conspicuous by their absence as the Model Code of Conduct kicked in – it prohibits political advertising. Interestingly, The Hindu reports that on Sunday, “Kashmir dailies run blank pages” to protest the ban on government adverts — the main source of revenue for the papers. The outcome of the battle for 543 seats held centre stage on TV prime time and this morning’s newspapers. While the usual political “tu-tu main-main” continued on some channels (Aaj Tak), others like ABP, Zee News presented opinion polls and or what Republic TV coyly called, “National Approval Ratings”. Still others, like Times Now and India Today held “poll tracker” (Times Now) and “sentiment tracker” (India Today). News 24 had a mood of the nation survey. All the polls, surveys gave BJP and PM Modi the Pulwama-Balakot advantage. Times Now and India Today found a significant rise in Modi’s popularity across the country since the airstrike. 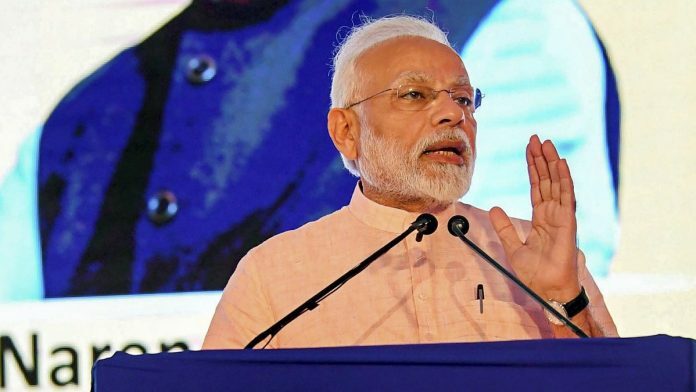 On News 24 a “maha poll” found Modi had reaped a whopping 77 per cent advantage from the Balakot strikes, according to respondents. As for the figures, India TV-CNX Opinion poll, gave NDA 285 with BJP to win 238. Congress-led UPA is to win 126 seats with Congress to rise from 44 seats to 82 – a gain of 38 since 2014—Others get 132. Both Republic TV and ABP News partnered C-Voter and came up with a little less for NDA: NDA 264, UPA 141 Others 138 while Zee-24 Taas had 264 (NDA), 165 (UPA) and 114 (Others). This prompted “RSS thinker” Raghav Awasthi to claim the “people have already made their choice” — BJP was “home and dry” (India Today). Anchor Rahul Kanwal agreed: “No sign of anti incumbency” for Modi, he said. So did CNN News18’s Anand Narasimhan: “There’s a certain level of comfort for BJP”. On Aaj Tak, Rajdeep Sardesai disagreed. The India Today prime time anchor said it depended if people voted on regional or national issues. And Times Now “poll tracker” — largely conducted before Balakot — found that 47 per cent of respondents thought Modi’s government had not fulfilled its promises. Times Now debate “#May23WithTimesNow” with Padmaja Joshi gave us a hint at the political tone of the forthcoming campaign — in the field and on TV news. There’s excitement about the election schedule and the media welcomes it with alacrity: Hindustan Times and Times of India dedicate parts of their front page flaps as well as page 1 to the news. In its all caps page 1 headline, “NOW OPEN: ELECTIONS 2019,” HT emphasises the grand scale of the looming elections. While other newspapers stick to reporting the schedule and its implications, TOI’s lead is more of a commentary, suggesting that BJP has won already: “The 2019 poll battle has begun with the contest, charged by the recent Pulwama terror attack and India’s retaliatory air strikes, shaping into a hotly debated referendum on Prime Minister Narendra Modi’s leadership and alternatives offered by a patchwork of opposition alliances,” it writes in its opening paragraph. “…The polls are a stern test for Rahul, who has gone all out to attack Modi.” It even runs a “SWOT” analysis between the NDA, UPA, and “Third front”. Modi also counts as one of TOI’s 15 factors “that hold the key” to the elections—interestingly, Ram mandir does not feature. In an exclusive second lead, `Rural distress deepens…’’, Express finds a slowdown in rural wage rates coupled with depressed farmer prices “point to an overall picture of rural stress going beyond agriculture ahead of the Lok Sabha elections”. The Hindu sticks to the facts of the upcoming elections, but notices that “It will be a month-long wait for voters in Kerala to get to know the outcome of the elections to the 20 Lok Sabha constituencies in the State,” since they are slated to vote in one phase on 23 April. Results are out on 23 May. Newspapers acknowledge that Jammu and Kashmir will not participate in the assembly elections because of “constraints in the availability of security forces and recent violence among other factors behind the decision”, leaving “mainstream parties in the Valley disappointed”, writes HT. In its ‘Explained’ box, Express says the decision is “not extraordinary…The main reason behind this is availability of adequate security forces”. HT, Hindu and The Economic Times comment on the announcement of elections Sunday. Hindu’s “An open field” looks at Uttar Pradesh, which holds the key to the 2019 verdict. It argues that while for the Opposition “an overarching social coalition of Dalits, backwards and Muslims” could block Bharatiya Janata Party, “a Hindu nationalist meta narrative” could assist Narendra Modi. ET’s “World’s Largest Democratic Exercise,” finds it “disappointing” that elections to J&K’s assembly are not being held alongside Lok Sabha elections. If voters can cast votes for LS candidates “they can just as well cast a vote” to elect state legislators, it writes. Across papers, the poll announcement leads the way. Dainik Bhaskar’s take is “Satta ke Saat charan.” The newspaper makes the interesting point that 332 seats in 9 states will see a three-cornered contest. Amar Ujala says that by using VVPAT in 100 per cent booths, EC has answered all misgivings about EVM machines. Jagran reports Congress claims that it is ready for electoral war—Congress says, “Hogi satya ki Jeet”. Elections lead the Tamil dailies on Page 1 too but the focus is different: it’s on ‘April 18’ – the polling date in Tamil Nadu. These stories also note simultaneous by-elections for the 18 out of 21 vacant assembly seats in the state. Dinamani and Dinamalar also highlight the moral code of conduct. The announcement of election shrinks space for political reports on the front pages, however, The Hindu Tamil and Daily Thanthi note the significance of DMDK joining the ADMK alliance”.